New legislation brings changes and challenges to OHV recreation and enforcement. Amendments to state off-highway vehicle laws allow local authorities to designate paved roads where OHV operation is legal under specific conditions. Above: A volunteer off-highway vehicle instructor guides a your rider through a safety course.NMDGF photo by Dan Williams. Off-highway vehicle riders and officers tasked with enforcing laws are facing new challenges this year with the enactment of a state law allows OHV use on some paved roads. Previously, all public paved roads were off-limits to OHVs, except at trail crossings. Now, local authorities such as village councils or the State Transportation Commission can designate paved roads where OHV riding is legal under specific conditions. The law follows a trend among states to increase access and stimulate OHV tourism and outdoor recreation. Neighboring states Arizona, Colorado and Utah all allow paved-road operation in various ways and areas. “These changes will make it important for off-highway enthusiasts to understand the rules, not just in the area they live, but also in any location they plan to visit and use such a vehicle. Understanding the laws will help recreationists avoid potential problems,” said Craig Sanchez, assistant chief of education for the New Mexico Department of Game and Fish. The law does not create unregulated use of the vehicles on paved roads. In fact, it adds requirements for adults that previously applied only to youths. Now, adults operating off-highway vehicles on paved roads must wear approved helmets and eye protection and carry a permit as proof that they have received some type of OHV safety training. Paved-road OHV operators also must have a driver’s license and proof of insurance, just like car and truck drivers. The vehicles must carry current OHV registration and be equipped with mirrors, mufflers, brakes, headlights and taillights. OHVs legally can be operated on paved roads only where permitted by local authorities such as village councils, or by the State Transportation Commission. Off-highway motorcycles and snowmobiles are still restricted from paved-road operation except on road shoulders and trail crossings. 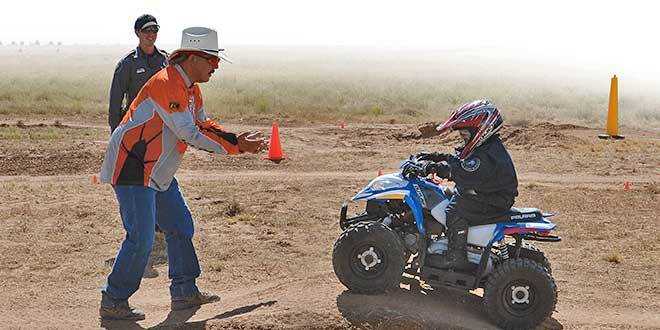 Some communities already are acting on the relaxed OHV rules. The City of Farmington passed an ordinance allowing side-by-side OHVs to be operated on specific paved roads within its jurisdiction. All-terrain vehicles are not included, and the ordinance sets a maximum speed limit of 45 mph unless otherwise posted. It also cites the OHV Act speed limit of 10 mph within 200 feet of a business, animal shelter, horseback rider, bicyclist, pedestrian, livestock or occupied dwelling, unless the person operates the vehicle on a closed course or track. The OHV Act of 2005 previously applied exclusively to off-road operation on public lands, where most enforcement was done by New Mexico Department of Game and Fish conservation officers and federal agency officers. The amended act will increase local, county and state police encounters with OHV users. The Department of Game and Fish will provide links on its website, www.wildlife.state.nm.us, to local ordinances as they are made known to the department.